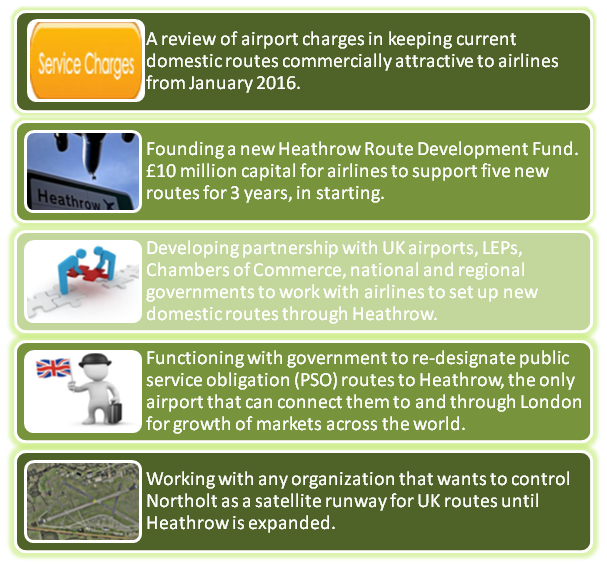 Home > Blog > Heathrow’s new strategy to connect UK nation & regions for global growth. Heathrow’s new strategy to connect UK nation & regions for global growth. Heathrow airport has declared a new expansion strategy which is designed to connect the UK’s people and regions for growth of markets around the world. This project is likely to deliver trade and investment opportunities worth billions of pounds. These steps would be helpful for the improvement of seven current routes, offering the potential for well timed and more frequent flights. Analysis shows that travelers would be able to fly form nine airports which are not served by Heathrow, at present. That means no less than 16 regional airports will have the opportunity of direct links to the UK’s hub. These commitments have been announced with the collaboration of the national connectivity task force. This task force was founded in 2014 and aimed to give advices to enhance connectivity between the UK’s nations, regions and the major airports in the South East. They were straight on an earlier declaration by EasyJet that it plans to manage from an expanded Heathrow, competing on several existing domestic routes and providing new links to four airports across the UK. Airports Commission analysis has already exposed that an expanded Heathrow will deliver up to £114bn in monetary benefit outside London & the South East and will double the amount that would be delivered by an expanded Gatwick. This strategy will definitely help Heathrow to be the leading airport. Projects for Secure Car Parking Heathrow must be focused upon in this regard because people use airport parking on large scale and they will demand for better airport parking along with all other developments. Previous PostGuidance for Diabetics for healthy Air Travel.Next PostGatwick Airport Divulges New Plans to Change Retail and F&B Offer. What's up it's me, I am also visiting this site on a regular basis, this web site is really nice and the users are in fact sharing nice thoughts.